Daily Illuminator: Stock Up! 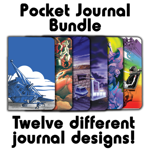 Folders And Journals Featuring Classic Steve Jackson Games Artwork! Pocket Folders – One dozen different 9" x 12" two-pocket folders that are great for carrying character sheets, vehicle designs, scenarios, printed FAQ and web articles, and anything else on a standard sheet of paper. Use these for office and school to show the world that you're a gamer! Pocket Journals – Everyone needs a place to record game and meeting notes, right? With 12 different designs, you've got a wide selection of covers to choose from the next time you need to write out a grocery list . . . or plan the destruction of the player characters in your TFT campaign. If you're a fan of custom school and office supplies, this chance to grab collections of folders and journals is one that cannot be missed. We publish several games and expansions each year, but office supplies only come along every now and then, so these folders and journals featuring classic game art are unlikely to be reprinted often . . . if ever! Stock up today, gang!